Checkpoint Therapeutics released preliminary results for its clinical trial on Thursday, but investors are not sharing the enthusiasm. Although Checkpoint Therapeutic’s (NASDAQ:CKPT) released preliminary results of its clinical trial on Thursday (September 6), investors are not sharing the enthusiasm. Following the announcement, the company’s share price dropped over 11 percent to US$4.00. The clinical trial was for CK-101, a drug in Phase 1/2 development for non-small cell lung cancer (NSCLC). Checkpoint plans to present the rest of the information this preliminary data from the ongoing trial at the International Association for the Study of Lung Cancer conference in Toronto on September 24, 2018. “These preliminary data demonstrate CK-101 is well-tolerated at the doses tested while also demonstrating encouraging anti-tumor activity,” Melissa Johnson, study chair of the trial, said in the press release. Checkpoint’s CEO James Oliviero said the company intends to start a Phase 3 trial for the drug in 2019 and that it may be the second third-gen EGFR inhibitor to enter the market. This was the first trial testing the drug on human patients which was focused on evaluating the safety and tolerability of the drug. Patients enrolled were given a range of doses between 100 to 1,200 mg a day depending on their tumor size. The trial found that no patients had serious side effects to the drug or side effects great enough to prevent the level of treatment to increase drug dosing. Some less serious side effects included nausea, diarrhea, tear secretion and vomiting. For the 19 patients in the study, all received a response with their respective tumors — most with a partial response — meaning at least 50 percent reduction in tumor size. The higher the drug dose matched a higher rate of patient tumor response. However, the time to measure disease progression or death and tumor response to disease progression could not be measured by the cut off date of collecting this data. The company will continue to enroll patients to identify the best dose to see the best response from patients in the trial. Common mutations are caused in the first few months of treatment with first-gen EGRF inhibitors for some types of cancer. The mutations create drug resistance for the tumors and it can often become altogether ineffective. The second-gen drugs are more potent against the mutations but don’t have as many benefits for NSCLC patients. Against that backdrop of the previous chemotherapies is where Checkpoint’s drug comes into play. It’s designed to pick up the loose ends of these other chemotherapies by improving the mutation resistance and other sensitivities. This also allows the drug to do more work improving tumor size for patients, and more could be discovered in upcoming trials. Lung cancer is the second most common cancer in the US which represents over 234,000 new cases estimated for 2018, according to the American Cancer Society. About 85 percent of these lung cancer cases are for NSCLC. The drug was acquired by NeuPharma in 2015 and Checkpoint has a nearly exclusive worldwide license for the drug aside from some Asian countries. As noted with this drug, the company is working on anti-cancer agents and immuno-oncology programs, with a soft focus on acquiring drugs. The company has six programs in development, with a focus in oncology. Despite the drop to its share price, H.C. Wainwright analyst Joseph Pantginis released a note to investors with a US$11 price target Thursday and reiterated a “Buy” rating for the company. Checkpoint is a majority-controlled subsidiary of Fortress Biotech (NASDAQ:FBIO), so investors interested in more information can always check out its website along with Checkpoint’s. Ahead of the conference in late September, investors can read more about this trial on the website for the abstract which will be presented then. More information should be released the day of the presentation. Information on the company’s new Phase 3 trial can also be expected in 2019. 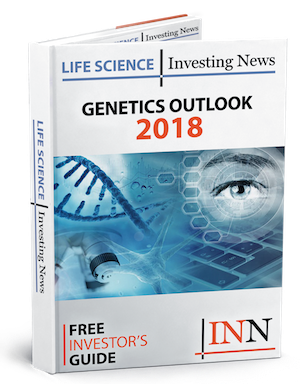 Get the latest information about companies associated with Genetics Investing Delivered directly to your inbox.